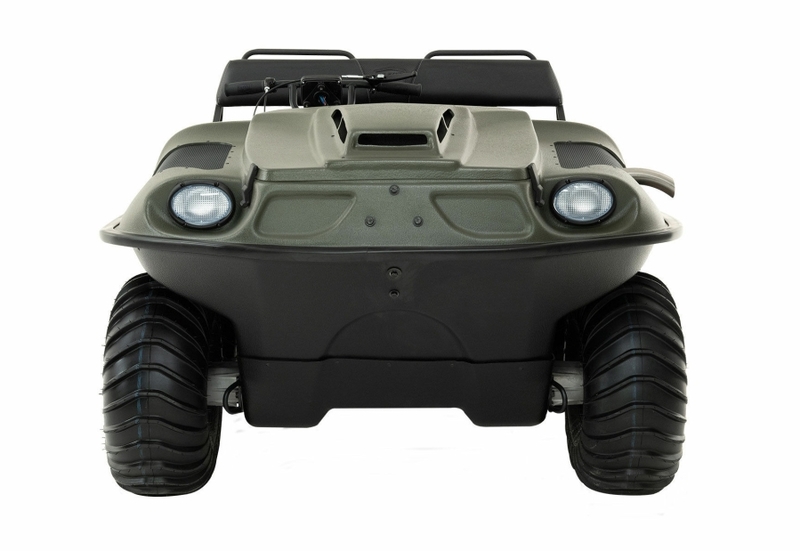 The Frontier 600 6x6 is the most affordable new amphibious ATV manufactured today. Powered by a Briggs and Stratton Vanguard 18hp carbureted air-cooled engine mated to the Argo Generation II planetary differential transmission with high/low forward, neutral and reverse in the standard gear ratio. The Frontier 600 comes standard with a full-length skid plate and bilge pump. 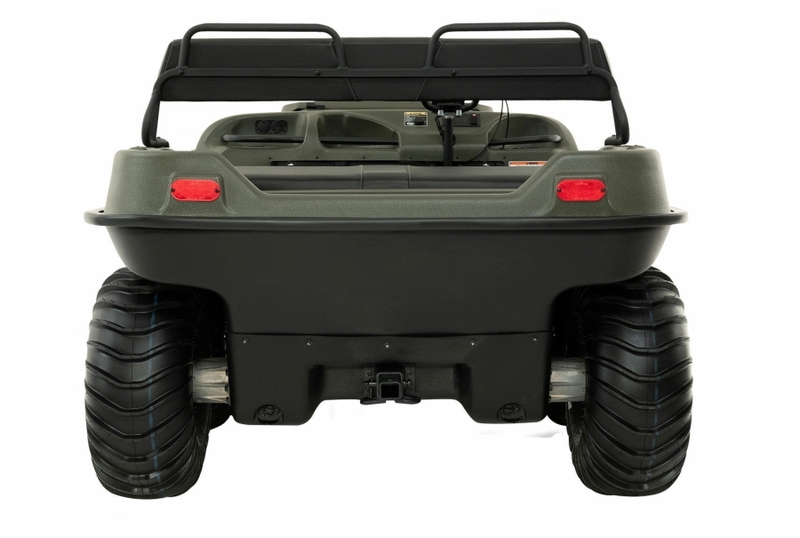 The Frontier 600 6x6 comes standard with Argo / Carlisle 24x1-8 (610 mm) 4 ply mud and swim tires mounted on steel offset 8" rims give this machine great traction and best in class payload all while providing a swim speed of 3.0 mph. An LCD display shows speed, rpm, and voltage of the battery. The unit is available only in Tundra green. The Frontier 600 6x6 is powered by a 4-stroke OHV V-Twin air-cooled 570cc, 18 hp (13.4 kW) Briggs and Stratton Vanguard engine and uses maintenance kit # M-202. It has a load capacity of up to 650 lb. / 295 kg on land and 450 lb. 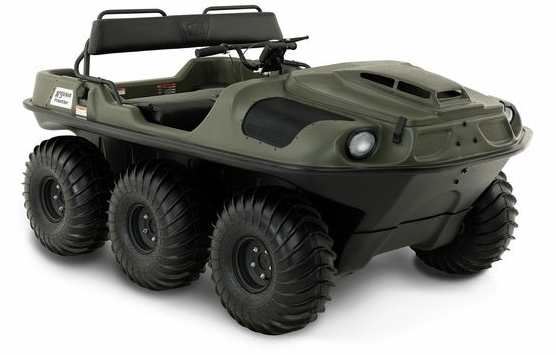 / 204 kg capacity on the water with the 24" tires installed. 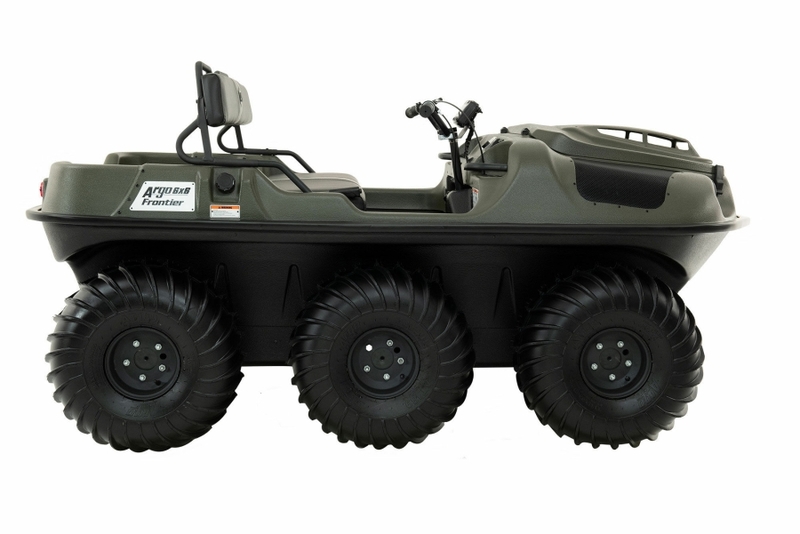 It can transport 4 passengers on land, 2 on water and features a towing capacity of 1200 lb. / 544 kg. • Dependable Argo Classic Generation II planetary differential transmission with High/Low Forward, Neutral and Reverse. Q: What is the length and width of this model?